As a young pup, Raku Narazumono witnessed the brutal execution of his mother and father. Their taxes were past due – the late fee, their lives. Dragged to the magistrate’s palace, young Raku was enslaved, forced to clean the gutters and sewers of the mountainside estate. His days were spent toiling in filth, praying for divine deliverance, and studying every inch of the compound. While silently contemplating his wishes one dark morning, a shaft of light pierced the clouds, shining down to illuminate a prayer-sword – an answer from the kami. His salvation. With righteous fury in his breast, Raku hid in the palace privy awaiting his revenge… he then skewered that foul magistrate from the bottom up. Now, Raku wanders the countryside by day, a simple peasant with little more than the hat on his head, the sword in his hand and the fire of justice in his heart. Come nightfall, Raku dons his mask and raids the mansions of corrupt officials, delivering swift and sure righteousness with deadly tekagi-shuko to all those who hold their citizens in thrall. Redistributing the ill-gotten spoils to the poor and downtrodden, Raku’s mission is to ensure no more orphans suffer his same sorrow. In the brewing Gold Life struggle, Raku sells his blades to the highest bidder – at times donning the crimson robes for the Red Hand Gang. While both sides try to eliminate this principled agent of vengeance, none can succeed. And so, Raku ambles the countryside spreading wealth and hope. 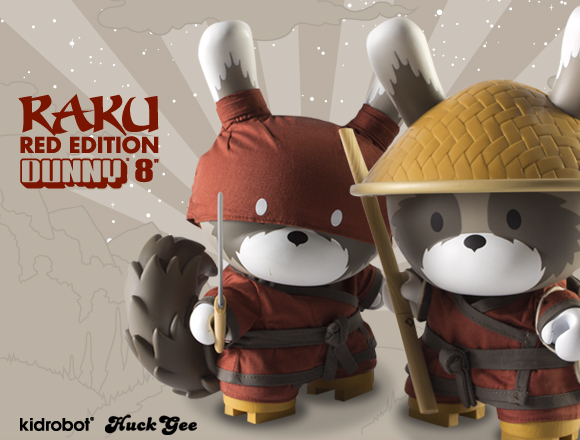 • Red 8-inch Raku Dunnys (Day version & Night version) are Kidrobot exclusives, sold only at Kidrobot stores and kidrobot.com beginning May 26 for $100 each (£79.90 UK; 92.70€ Europe). • Limited to 500 pieces per style worldwide. • Daylight’s cloth-robed Raku comes with a sculpted tail, removable peasant sandals and plastic bamboo hat, and travels with a coiled rope, bedroll, and walking staff in-hand. • Night’s ninja Raku trades his peasant hat for a wind-whipped mask, comes with a sculpted tail, and adds a blade and tekagi-shuko to his lethal arsenal. Be warned; Gold Life is coming. 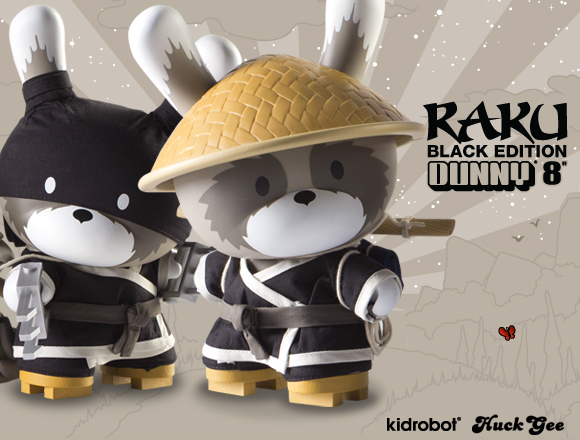 Black 8-inch Raku Dunnys by Huck Gee (Day version & Night version) are available only at specialty retailers beginning May 26 for $100 each (£79.90 UK; 92.70€ Europe). Limited to 500 pieces per style worldwide. The post Product Preview – Raku Dunny appeared first on Kidrobot Blog.